Still the least expensive way to meet your floor covering needs - soft, durable, stain-resistant carpeting! From solid colors to beautiful patterns and designs, we offer something for everyone. Accent hardwood, stone, or tile with beautiful carpeting! 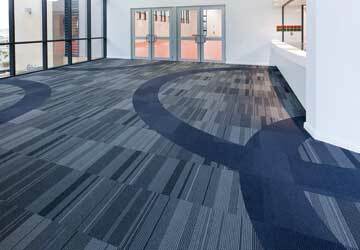 Carpet tile, also called modular tile or carpet squares, are a traditional solution for commercial flooring installations. 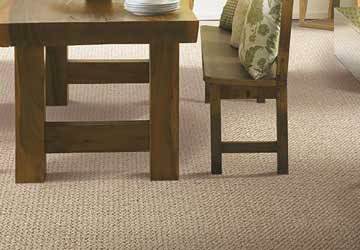 Due to their easy installs, you will find carpet tile in most commercial settings, and they’re even a perfect solution for the residential household. Nothing beats the natural beauty of a hardwood floor. Many products offer ¾” solid, structurally-sound engineered, easy to install click hardwood. With an endless selection of floor species and color finishes, hardwood finds a place in any setting. It’s long lasting and stands the test of time! 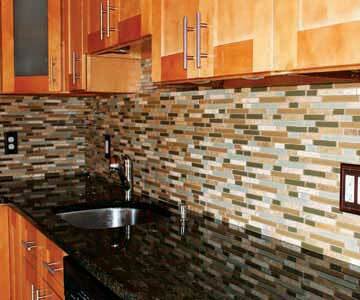 Ceramic tile, porcelain tile, stone tile and glass tile: the options are endless and the results are fantastic. Perfect for kitchens, bathrooms, living rooms, showers, great rooms and more, this very strong product can be installed in almost any setting. From classic to ultra modern, tile is both versatile and long lasting for interior installations, and some porcelain can be installed outdoors. 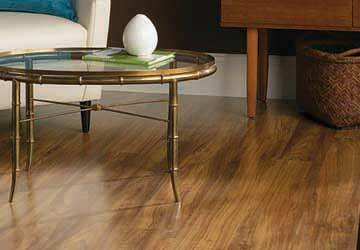 Once the biggest flooring category to hit the market, laminate has declined in popularity, taking a backseat to waterproof luxury vinyl plank. However, laminate still offers some of the most realistic-looking hardwood and stone patterns available. 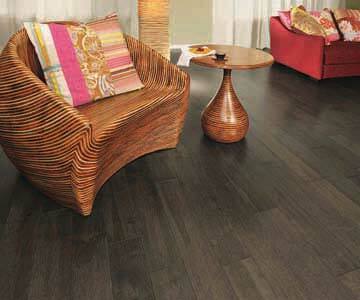 Both durable and stable underfoot, laminate is an easy to install option in today’s market. 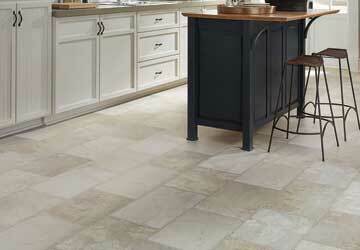 Designed to look like tile, marble, stone or wood, sheet vinyl is an economical and popular flooring option. Available in one-sheet widths of 6’, 12’ and 13’2”, it allows for seamless-looking installations, and as a resilient material with a wide selection, it’s popular in operating rooms and senior living facilities, and can the perfect choice for an active household. 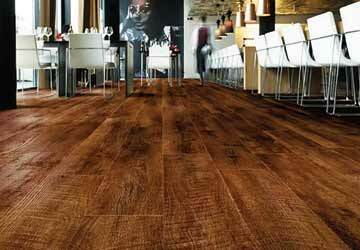 Luxury Vinyl Tile (LVT) looks like stone or ceramic tile and Luxury Vinyl Plank (LVP) looks like hardwood, with the character, color and species of the real thing. A more affordable option that is waterproof and warmer underfoot, these luxury choices offer the texture and characteristics of the real materials. 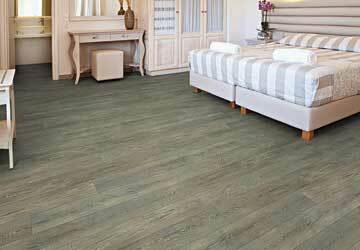 Enhanced Vinyl Plank (EVP) is the newest revolution in luxury vinyl flooring. The construction features an innovative core made from sustainable products like recycled wood or bamboo dust, limestone, and virgin PVC. Most floors in the category are 100% waterproof, and can be installed in wet areas and never swell. Keystone Floor Products offers the flooring tools and supplies to get everyday jobs done: staples, tackstrip, heat tape, floor patch, seam sealers, underlayment, plywood, adhesives and more. 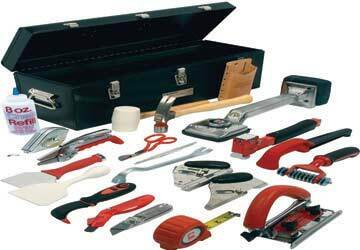 Our tools for the trade come from top manufacturers, and we keep many options on hand, but if we don’t have stock, we’ll order it for you. We take care of the installer trade like no other supplier.